Alpine skiing (what we used to call downhill skiing), is one of the major sports that people over fifty seem to give up first. However, with the new equipment and techniques, the over fifty population should revisit this sport. 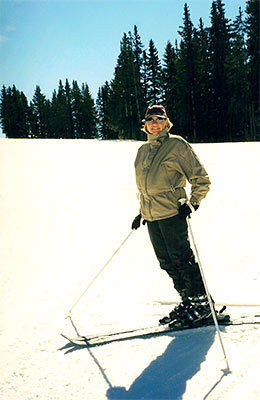 I became a ski instructor at the age of 58 after skiing for 46 years. I was amazed how much easier the sport is now than 30 years ago. We find we can still become better skiers each year. The only injuries I had last year were falling down the garage stairs on the way to skiing and falling into the ski rack while I was standing talking to a friend. Did you know there is an over 70's club? Email us your favorite alpine skiing stories!